The USA is being increasingly isolated. Now the USA is being blamed for damaging “the trust in the international order.” It is also being blamed for climate problems–and the United Nations is NOT the solution. 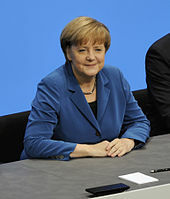 Angela Merkel’s comments are consistent with various biblical prophecies. He has done so and caused much anger in Europe. Angela Merkel’s comments are consistent with that. The Pope expects the Vatican to be involved in major peace deals. Expect Vatican endorsement of the Daniel 9:27 deal (see also The ‘Peace Deal’ of Daniel 9:27). Pope Francis is an ecumenically-oriented pontiff, and we have seen more ecumenically-oriented Orthodox and Protestant leaders the past several years than have been seen in centuries. Many seem to have similar objectives. Even the head of the United Nations supports their agenda (see United Nations: Humankind’s Last Hope or New World Order?). So, we see the head of Germany speaking at a Catholic conference, chastising the USA, and also calling for Europe to take its fate in its own hands. And we see the head of the Church of Rome promoting an interfaith peace program. Europe will one day not only stop relying on the military of the USA, it will one day destroy the USA (Daniel 11:39) and its Anglo-Saxon descended allies (Daniel 8:24-25). Before that, a temporary ‘peace deal’ will be implemented (The ‘Peace Deal’ of Daniel 9:27)–Europe and the Vatican will be involved. The statements at the Muenster conference are consistent with biblical prophecies. This entry was posted on Friday, May 11th, 2018 at 6:33 am	and is filed under Prophecy, Religious News.